Last update: September 30, 2014. Instead of one tart for six people i made three tarts, each for two. Good thing is that you may prepare your tart shell and the sauteed leeks ahead of time (possibly the previous day), secure them with sealed tops in cool temperature and assemble the dish only when you are ready to serve. You still need some time to heat the oven and about 1 hour time to bake and let the quiche rest, but your hands are clean and there it bakes, on its own.. They freeze and re-heat well (place frozen on a heavy cast iron or otherwise proper tart dish into the hot (350F/175C) oven, leave till hot in the centre). tart shell; i like this one, but you may choose any old shell you favour, as long as it is not sweet. 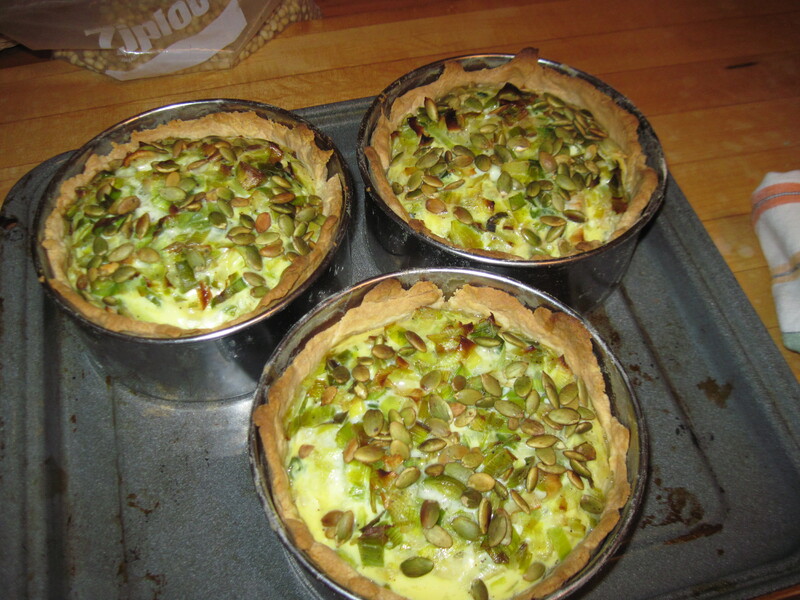 some lightly toasted pumpkin seeds – i made my first quiche without them, and it was not as fancy as it could, but it was very edible… The presence of seeds or pine nuts, or any other stuff to decorate/excite the quiche with should be further investigated. Following the recipe prepare the shell. I would pre-bake it, but it may not be necessary. The oven i experimented with is not a device i would bet my life on. In my latest attempt the quiche was very good, but the central part of the shell bottom could have been better baked – hence my willingness to try with the pre-baking option. Clean and slice the leaks. Heat the butter (or oil) in a large, heavy frying pan (or a flat pot) . Drop the leeks on hot oil. Slowly, on medium heat, saute the greens until well wilted. You need to stir them often, to make sure the whole lot is indeed being heated, but not reaching the brown, fried state. Test for spices – a bit of salt and more of freshly ground pepper ape appreciated. When the leeks are ready, you can set them aside and secure for storage (till tomorrow?) or proceed with the assembly. Set the oven to 450F/225C. With the electric or traditional manual whisk mix the eggs, milk, and some salt/pepper. Place the shell on a flat cookie roasting sheet (it is a safety precaution only, to catch any possible spills of grease (from the shell) or and over-supply of egg-milk mixture . Spoon the leeks into the shell, placing then evenly across the available real estate. Pour the eggy milk over the leeks, gently. Drop the pumpkin seed (or other, whatever you chose to use) over the whole affair. Do not open the door. Have faith. Set the temperature down to 375F/185F. 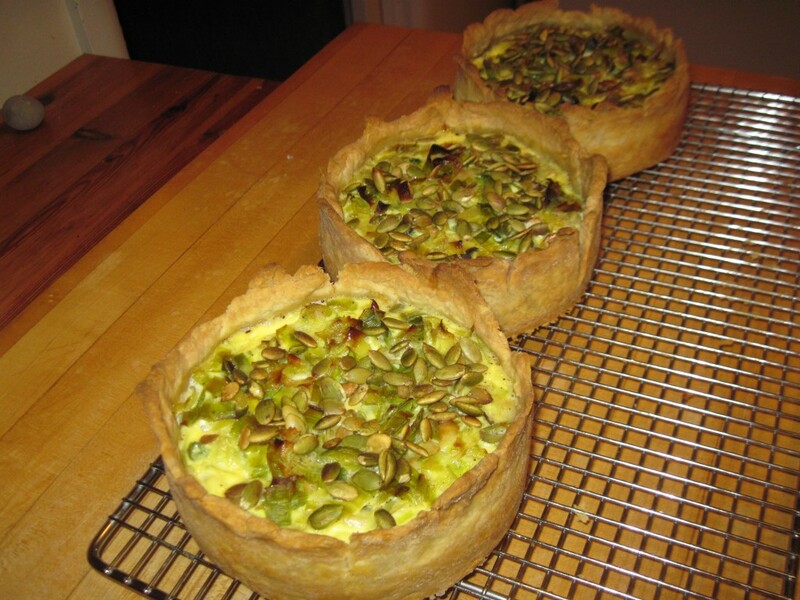 Leave the quiche to bake for another 40 minutes or so. It must reach the level when the milky part is no longer runny (watch out the centre of the quiche!). When ready, take it out of the oven and let sit for some 10-15 minutes before carving and serving with some decent tossed salad and possible some good chilled vino verde. This entry was posted in Not sweet but savoury / Tarty nie całkiem deserowe and tagged lunch, vegetarian. Bookmark the permalink.